To meet the utmost demands of our customers, we are offering them Hydraulic Chuck of best quality. We work in industry with the view to satisfying our customers by offering them best quality Hydraulic Chuck at nominal prices because we understand the financial limitations of our elite customers. Kennametal has added HydroForce HTTM, a new Universal Hydraulic Chuck as a cost-effective chucking solution that simplifies inventory while maximising tool life and machining results for milling, drilling, reaming, and other rotating applications. - Birla Precision offers a wide range in hydraulic chucks on BT/DV/CAT & HSK tapers. - TIR within 5 microns at 4 times the cutting tool diameter. We manufacture wide range of Hydraulic CNC Chuck under the Brand name AIRXPA TOOLS. We are engaged in offering a quality approved range of 3 Jaw Hydraulic Power Chuck. We do not work in Manual Chucks. We are wholesale Hydrogrip Chucks. - Used where high accuracy and repeatability is required. - Our Holders are balanced up to 2.5G @ 20, 000 rpm. Sizes available : 3", 6", 8", 10" & 12"
TIR within 5 microns at 4 times the cutting tool diameter. Improved vibration dampening by using a patented silicon compound as the pressuring medium. Repeatability of 3 microns TIR. The integral clamping sleeve is hardened & tempered to reduce chuck wear & give a longer service life. 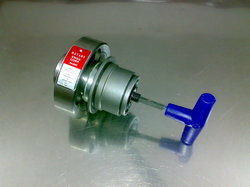 Always supplied in pre-balanced condition at G2.5, at 20, 000RPM. Being a leading firm in this industry, we are deeply engaged in offering a high-quality range of High Speed Jaw Hydraulic Chuck.